Dr. Bharany Padmanabhan, formerly of Cambridge Hospital has filed a federal lawsuit against the City of Cambridge, (which owns Cambridge Hospital) as well as some members of the staff of the Massachusetts Board of Registration in Medicine (BOM). The suit seeks millions in compensation for unspecified damages. Dr. Bharany says he filed the suit against the city and the hospital saying he is a whistleblower and was fired for protesting the neglect of patients at Cambridge Hospital. He further alleges insurance fraud and launched a website with scores of documents available to make his case. Dr. Bharany says that as a doctor at Cambridge, he discovered brain scans were not being read, but that summaries of brain scan reports were sent to him stating that they had been read, but declared inaccurate diagnoses. “The first email I wrote to Dr. Glick, who was the chief of neurology, documented patient neglect and official brain scan reports being issued that were 100% wrong. It suggested that the radiologist had not even looked at the scans when he wrote the reports. Dr. Glick called my email a ‘smoking gun’. He approached the leadership of the hospital to improve matters and within two years we were both gone,” he said. Dr. Bharany filed his suit in Norfolk Superior Court “because the government failed me completely in terms of upholding the rule of law, and I found I had no other choice other than to file a civil lawsuit.” The suit was elevated to federal court. Dr. Bharany says that he brought the lawsuit so that he could be made whole after being wrongfully terminated and his livelihood being taken from him. Dr. Bharany says that he has been trying, and will continue to try and educate the public so they will pressure government officials to solve the problems at Cambridge Hospital and the BOM. “Their first response to my lawsuit was for the opposition to file a motion to impound all the documents, every scrap of paper, and hide it from the taxpayers. I fought that, and happily I won. So all the documents now remain in the public domain. A good chunk of them have been put up on Cambridge fraudcase.com. “The story Cambridge Hospital is telling is, that I am a bad physician who is an imminent threat to public safety and does not know how to read brain MRI scans, or diagnose MS, even though I have a PhD in MS and 2 fellowships in MS. Shortly after our interview, US District Court Judge William Young took up this lawsuit for the first time. Next : How does Cambridge Hospital respond to Dr. Bharany’s Charges? 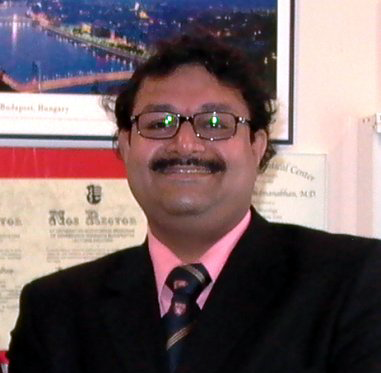 For those of you who do not know Dr. Bharani, he is an MS Expert & just an incredible specialist/person! Your patients stand behind you, Dr. Bharani!